And even better, you can throw your gloves in the washer to clean them after use! The features include the patented Schiek fins for ease in removal, cushioned grip including the thumb area and premium Amara fabric that stays soft and supple. The gloves are double stitched throughout and washable. 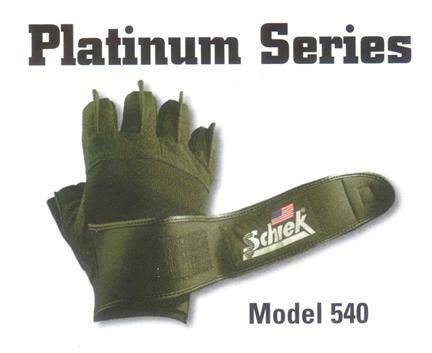 The Platinum Series is Schiek's top-of-the-line lifting glove (and also its best selling). 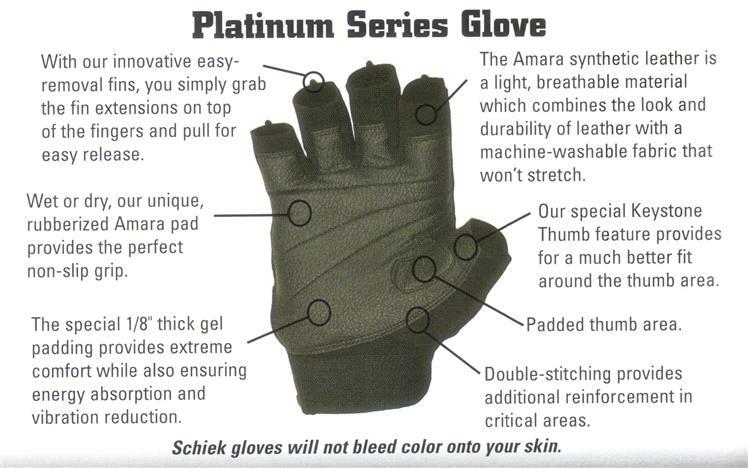 All Platinum gloves offer rubberized supergrip, longer 3/4" finger length and gel thumb pad. This model has wrist wraps. Measure around your palm to get the correct fit. This auction is for a size SMALL, or 7-8". Make sure you measure your palm...some lifters say they fit a half size too big. If your not sure what size, go with the smaller glove.